When Paula James is awakened by a gunshot, she knows she must escape her home immediately and go off the grid. When David van Pelt receives her call for help, he acts instinctively to shelter her, though he recently became engaged to another woman. And when Paula gives him an account of murder and mayhem in a county where the manufacture of drugs is rampant and the sheriff is crooked, they both decide, in their roles as investigative journalists, to find out who has turned the peaceful backwoods region into a lawless wilderness. David has always known Paula as sassy and strong, but upon encountering an unexpected vulnerability in her, he promises to stand by her whatever happens. Together they begin a life on the run, digging through countless layers of misdirection, all the while fighting the fierce attraction between them. It’s always fun to be a little bit scared when you know that you’re completely safe! That’s probably why I love suspense books so much. Add in a bit of romance and you’ve got something that I won’t be pulling my nose out of any time soon! That was the case with Breaking News by G.G. Vandagriff. I enjoyed the way this author pulled me into the story from the very first. Paula was headed out the window after hearing a gunshot. Crazy! I can’t even imagine being awoken that way and having my wits about me enough to get out of there. And cover my tracks too! But that was exactly what Paula did. Not only that, she grabbed her little dog. And the two of them worked together to get away, find someone to believe they were innocent, and figure out who the bad guy was. I liked David in this one too! He was willing to believe Paula when there wasn’t any evidence to. And he even took a bullet for her in the story. He is the kind of guy you want watching your back if you’re ever on the run. An investigative reporter, David has access to a lot of things regular people don’t. And he has the brains to figure out who the bad guy is. You won’t want to stop reading this one until you’ve read the very last page! Just realize that this one’s a cliffhanger ending and you’re going to want the next one right away. 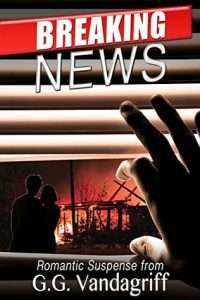 I was sent a copy of Breaking News as a gift. All opinions are my own.